A bad PowerPoint presentation can be confusing, annoying, and boring. 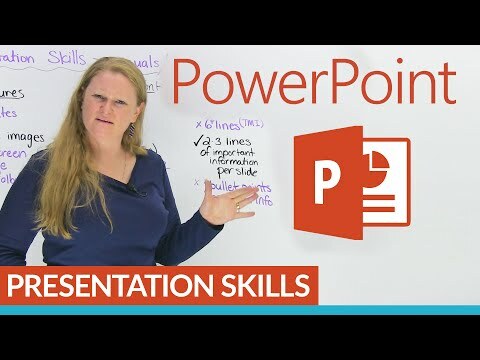 In this video, I'll give you my best tips for using PowerPoint in your presentations, whether they are for work or school. I'll talk about what makes a good presentation and what can ruin your presentation. You'll also learn how to use fonts, templates, and color to improve your slides. Do you know how much information to put on each slide? I'll answer that question and many more in this tutorial on using PowerPoint! Take a quiz on this video at www.engvid.com/how-to-give-the-best-powerpoint-presentation/ For more free presentation help, including advice for English learners gving presentations in English, go to www.presentationprep.com/ TRANSCRIPT Do you have to make presentations? Do you hate presentations? I like presentations, but one thing that you are probably maybe good at with presentations are making PowerPoint presentations, because you have visual aids to help you so you don't really have to talk as much, if you're nervous about talking. Presentation skills is something that you can work on. We have videos on www.engvid.com to help you with presentation skills. So, go and check those out for learning how to speak during presentations. But what we're going to focus on today is the visual aspect of presentations, so your PowerPoint things. Some things to do, and some things not to do. So, here we are, presentation skills. The first thing and one of the things that makes these presentations so fun are pictures. But we have to be careful. The templates that you have already included in your presentation software, they're boring. People use them all the time. So, I suggest you try and download some other pictures to make your presentation more interesting. And with that, make sure that on one slide you have one image. Make it interesting. Do not have a split screen. So, don't have two images on one slide. Do not have a collage, that's insane. A collage is many different small pictures on one screen. Even when I see a collage, there's a lot of collages coming out on Facebook now, and I'm like: "Too many pictures. Can't understand." Our brains just cannot comprehend all those pictures, especially when you're having the slide up for a short period of time. Don't make it like a photo album. Don't put millions and seven pictures, and... Keep it simple. Put a single image on each slide. Try and pick images that you actually like, and not too distracting. You don't want puppy dogs and things. Make something simple, but something that you like, and make sure it looks nice. The next one you have to worry about is the lettering. So, the lettering, you also might know this as the font. So, font and lettering are the same. One thing that you do not want to do is have really fancy or beautiful lettering. Simply... The reason is some people can't read when the letters are fancy, especially if you are doing presentations for people whose... Do not have English as their first language, if you take the letters and you write them even cursive, a lot of people have problems reading cursive. So, I suggest you use something more traditional. There's lots of very easy-to-read fonts you can get from your... Whatever word processing you use. So, make it simple, easy to read. Another problem that you might have is the script is too big or too small. So remember that when you're making your presentation, you're doing it probably on your laptop, or your desktop, or your iPad, or your phone, so the font or the lettering is going to be different than when you put it up on the projector. So if at all possible if you can, check it out before you do the presentation. Look at your... Hook up your laptop or whatever, and see if you can actually see it on the screen because the font is different. You might think that on your laptop it's a good size, but when it gets on the projection screen, it's tiny; or it takes up too much space and it's too big. Next up are the words or the text. So, there's been studies done on how many lines of text a human can absorb or understand, and any more than six, you've lost the people. So, try and keep on each slide one very simple image, with very traditional clear text, and put only two or three lines on each slide. Don't put bullet points. If you have more than six lines or if you have bullet points, again, we just... We just can't remember them all. We just lose focus. We have something called too much information, too much info, TMI. "Too much information" means that if you have more than two or three lines, we're just not getting it. Our brain can't... We just can't learn it like you want us to. С видео How to give the BEST PowerPoint presentation! изучение английского языка станет простым.